Aluminum is that rare kind of metal that has been considered as an integral material for every purpose, be it manufacturing, design jobs or construction. Since the time of its inception, the metal has gained a wide reputation for its versatility. Its superior quality makes it a nearly perfect metal for a plethora of applications. Because of its lightweight and other beneficial aspects, using aluminum profiles is preferred by most of the companies as the extruded aluminum is a cost effective option than various other metals. This metal has stood the test of time through centuries, and its usefulness has been proved time and again in the past, present and also in future. You might not have detailed knowledge about the types of metals, but the wide range of applications of the aluminum makes it one of the top choices for everyone. The third most abundant metal available, no other metal comes even close to aluminum when it is about the versatile uses. The fact that it is entirely 100% recyclable with absolutely no loss of natural properties makes the metal all the more desirable for factories all around the world. Only 5% of the energy is used to recycle scrap aluminum and transform it into new aluminum. The most convenient properties of the metal include its lightweight, strength, resistance to corrosion, durability, malleability and conductivity. The applications of aluminum can be found in places where you probably haven’t even imagined! Industrial applications - Aluminum has unbeatable strength to its weight ratio. The pure metal is hardly used in the commercial world, so the use of most aluminum such as extruded aluminum is mixed with other metals to make an alloy depending on the required use. For example, the 6063 and 6061 aluminum which uses magnesium and silicon as its alloying elements are the most common used aluminum alloy in extruding aluminum profiles. Aluminum has good heat transfer performance, this makes it useful for the motors and the solar market industries, automotive and also for carrying gas or liquids. The lightweight of the metal gives it the advantage to require less force at the time of the movement of the vehicle, which definitely leads to greater fuel efficiency. Being corrosion resistant, aluminum does not require anti-corrosion coatings and hence saves the cost up to a great extent. Though the automobile industry is still mostly dependent on steel, environmental awareness has got more and more people turning towards aluminum. This metal helps to reduce carbon-dioxide emissions and increases fuel efficiency. In fact, many experts are of the opinion that the average content of aluminum in a car will increase by 60% by 2025. Due to its perfect features for being used in the making of an aircraft, aluminum is also referred to as the ‘winged metal’! From the cockpit instruments to the fuselage, aluminum alloy is used extensively in modern aircraft. Even spacecraft like space shuttles have around 50%-90% of aluminum alloys in them. Buildings - Buildings having aluminum as its base metal do not almost have any maintenance cost due to the metal being corrosion resistant, the low maintenance factor of aluminum makes it the most desirable choice for most of the people. The aluminum profiles that are implemented as frames or rods, as well as, the aluminum curtain wall, door and window extrusions which are used for large-scale construction undoubtedly give you the biggest edge in terms of feasibility and decoration. A thermally efficient metal, it can be used to keep homes cool in summer and warm in winter. In fact, it can be cut or welded into any desired state, and this makes it more beneficial than plastic, wood or steel which are generally more difficult to curve. Aluminum was first used in the Empire State Building in New York and has continued to gain popularity since then. The lightweight makes it convenient for the workers to construct the buildings in faster and easier ways. In terms of the cost factor, a building made of steel will require deeper foundation because of its weight, which definitely will drive up the cost. But aluminum does not require any such foundation and hence will make you go easy on your pocket! Zaha Hadid’s London Aquatic Centre in London and the Bank of China headquarters in Hong Kong are two of the mention-worthy high-rise buildings that have been made out of aluminum. Consumer Goods - The appearance of the metal is the basic reason for getting used in most of the consumer goods. It is the best choice for interior designers since the aluminum materials like aluminum profiles, sheets, cast aluminum can be easily molded to give it the required shape. Tablets, smartphones, TVs and laptops are increasingly having the use of aluminum in them. The sophisticated appearance not only gives an oomph quotient to your gadgets, but also makes it easier to carry around. With every passing day, aluminum is replacing metals like plastic and steel in terms of consumer goods. In fact, using aluminum for electronic goods is the most convenient because it makes way for the heat to dissipate quickly and prevents the gadgets from getting overheated. Your home also can have a number of furniture made of aluminum like chairs, tables, lamps and decorative panels. Starting from the foil in the kitchen to the pots and pans used for cooking, the aluminum products have good heat conductivity, are non-toxic and are easier to clean because of its non-toxic property. In fact, the packaged foods and beverages that you get come in aluminum tins and cans. Brands like Pepsi and Coca-Cola have been using this metal for a long time. Whether you are aware about it or not, aluminum is almost everywhere around you. This metal provides you with rapid advancement in the diversity of aluminum alloy in various types of fields. 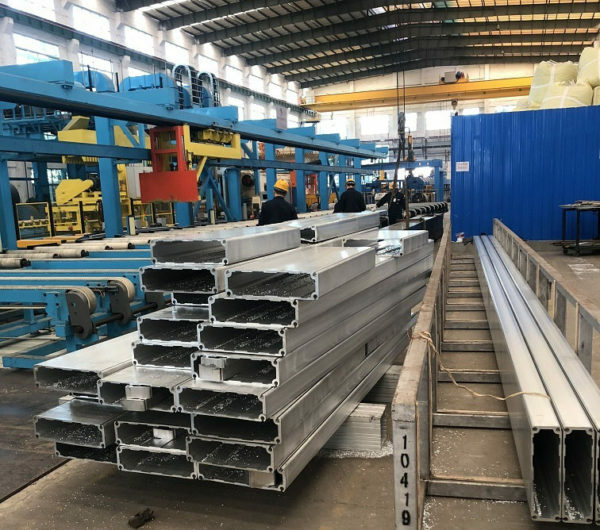 As an aluminum profiles manufacturer for over 15 years, we have been getting the benefit of the aluminum material and delivering our services to our customers by providing them with high quality and cost effective aluminum products.